Although the weather in the UK and Ireland is often cold and unpredictable, it is relatively uncommon to experience the impact of extreme temperatures on the performance of your mobile phone battery. Nevertheless, it is still possible to find yourself in an exposed area especially if you enjoy outdoor pursuits or you may be planning a winter holiday. According to Apple and Samsung, mobile phones and tablets should be used in temperatures ranging between 0°C and 35°C. Outside of that range the device may experience shortened battery life, trouble charging, as well as touchscreen issues. In more extreme cases, the device may shut down altogether. This has the potential to be catastrophic if you are in a situation where you need to summon emergency assistance, so it is important to be aware of the risk. The winter weather can be lots of fun, but not so much if you see your smartphone slide out of your pocket during a snowball fight. The cold alone may cause significant issues but the snow may also cause damage. Most new handsets have water resistance but it’s best to play it safe if you’re not sure. Consequently, if you are spending time in the bitter cold you are not the only one that needs to bundle up. Your cell phone does too! Keep your phone as close to you as possible. At least have it in your bag or coat pocket. Your body heat can help the device to stay within its operating range. Turn off your phone if you plan to spend an extended period in cold weather or consider using an insulated thermal protection phone case. Don’t leave your phone or tablet in your car overnight or for prolonged periods of time. If the phone unexpectedly shuts off, you shouldn’t restart the device immediately as it may cause more harm to the battery. Instead, wait until you are within the recommended temperature before switching on again. Once the lithium-ion battery warms up the device’s performance should resume as normal. If you plan to be in extreme temperatures, it is advisable to carry a backup power source for emergency. 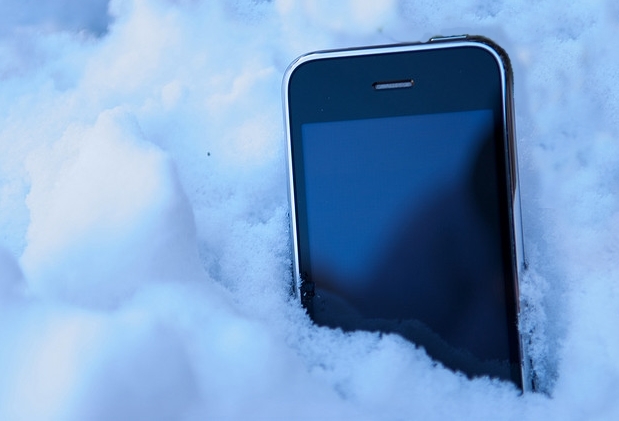 If your phone falls into the snow, the sooner you retrieve it the better. When you’ve rescued it, turn it off and remove the SIM card and battery, if possible. Only switch it on again if you are sure it is completely dry, and the temperature is restored. Contact our team if you need further support and advice. Most of all keep safe!